There are classical games based on mathematical properties that allow for mysterious play that allow also to foster curiosity. We present here an adapation of the classical game of binary cards, that uses the atomic symbol (or name) / atomic number duality for each element of the Periodic Table. This game can be performed to an individual, or for a group, or even in a classroom or auditorium, because many people can play simulteneously. It can also be played by someone individually. Here we present both ways: within a show/auditorium, and individually. The game involves showing in print or on screen any version or flavour of Periodic Table of the Chemical Elements (here we show the Girona version, but all use to be valid, and may be used to explain the Table), and ask someone to select (secretly, of course) an element amount the first five periods. Instead of asking someone, all members of a group or the whole audicence may play at the same time, if instructions are given for the individual play (see below). The selected element should be written somewhere for further use, and to prevent accidental mistakes because of it being forgotten. Once the element has been selected by someone, the host shows six images containing various elements. The host asks every time “Is your element among those in this image?”. The person playing the game must say “yes” or “no”. The host remembers the answers. When all six cards have been shown, the host reveals the element selected secretly by the player – a mysterious guess. For instance, if the player selected Cd, a positive answer will be received in the 5th and 6th cards, while “no” will be answered to the other cards. The upper-left corner elements of cards 5th and 6th are S and Ge, respectively, having atomic nubmers 16 and 32; thus, 16 + 32 = 48 – this is the value of the atomic number of the element selected by the player. The game proceeds in the same way, and leads to a surprising divination. One thinks of an element amont the first 5 periods of the Periodic Table, and looks for it in each of the six cards. If it is spotted, one accumulates the value of the atomic number of the element in the upper-left corner. The selected element atomic number will coincide with the resulting sum. Within the Magic and Science projecte, some time ago we edited four bookmarks with games of the Periodic Table. One of the bookmarks is just the game explained here, but limited to just 16 elements. To explain it, we recorded a video, where @pquimic provides instructions. If 16 elements are used, only 4 cards must be shown or, as we did in the bookmark, 4 columns and ask oneself (or the player) whether the selected element is contained in the 1st, 2nd, 3rd, and 4th columns. This is a game based on mathematical properties of powers of 2 – or from another point of view, on binary numbers. There is a wealth of information on this subject in the Internet. 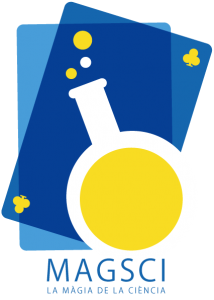 Indeed, in an educational environment on may ask students to build and design their own cards, their own Periodic Table, … Furthermore, it can be used to increase their communication skills, if they play the role of a host.